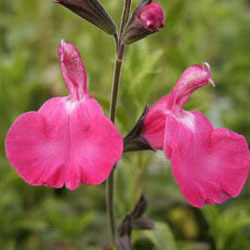 This selction from plantsman Richard Dufresne has perhaps the largest flowers of the Salvia microphylla cultivars. They are a nice deep pink color. This cultivar is also considered hardier than many others. Categories: bee nectar plants, butterfly nectar plants, fire resistant plants, hummingbird plants, Potted Plants, More..